Pack for a Purpose traveler Jerry Puda was on a flight on his way to deliver supplies to Hotel Casa Turire in Costa Rica when he ran into Costa Rica’s Club Sport Herediano soccer team on their way home from an international match. This team holds hero status amongst Costa Rica youth, but making the meeting more important for the kids was the fact that many of the team’s squad were on the Costa Rica National Team that participated in the World Cup. Here is a note he sent to the general manager of the team describing his experience of delivering the signed soccer balls to the children. “Your team made a very big impression on our group and the young children in La Canada School. What a nice group of gentlemen, kind and big hearts. 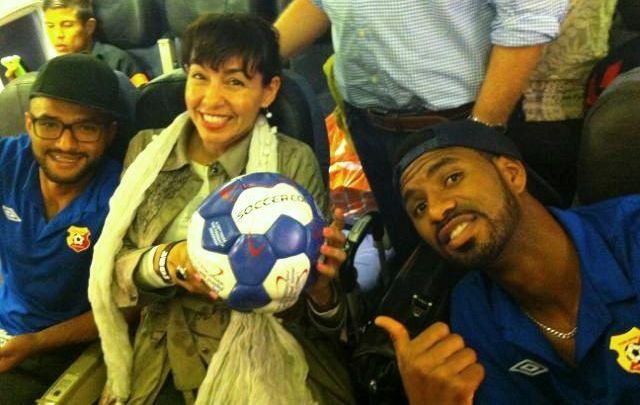 What made everything so special was that the team took the time on the plane to sign the soccer ball for the kids we would meet and deliver it to in La Canada, La Suiza, Turrialba. The day we delivered the supplies was an amazing day. The school and kids went nuts to see the ball signed by the players. They treasure it in their trophy case and play with the other balls we brought.